The Spooky Vegan: New Episode of Vegan Black Metal Chef! New Episode of Vegan Black Metal Chef! 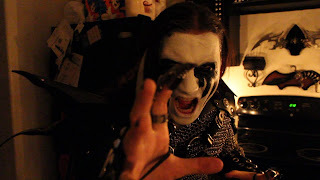 Horns up, peeps...a new episode of Vegan Black Metal Chef was posted today! I wholeheartedly agree with a comment on YouTube that states, "Pretty sure this﻿ kicks the sh*t out of Epic Meal Time"!! Hells to the YES! Check out video #2 below! In case you missed it the first time, here is the badass video that started it all! Check out Vegan Black Metal Chef on Facebook! !